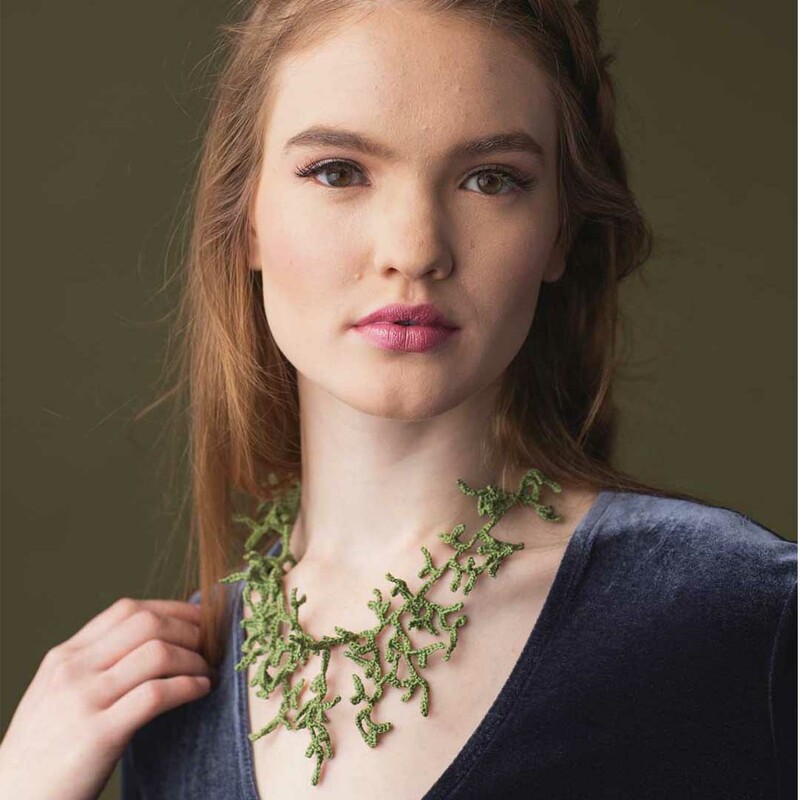 The Kelp Necklace by Julie H. Rose is one of my favorite projects from Interweave Crochet Spring 2019. 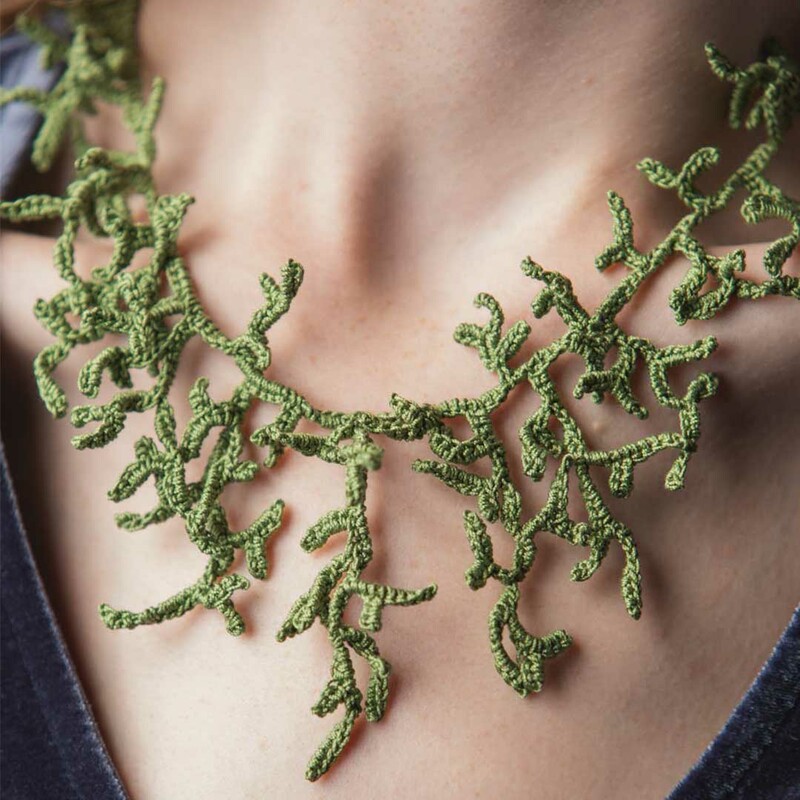 The project uses size 10 crochet thread to create a stunning necklace of greenery reminiscent of plants from under the sea. It seems like a necklace a real mermaid might wear! Julie H. Rose was inspired to make this piece of wearable art by the artwork she creates using crochet thread and other fiber arts techniques. If you would like to learn more about the work she creates, be sure to check out the issue and read our Q and A with Julie H. Rose. She talks about her inspiration, her background, and the extra materials she uses to make stunning shadow boxes of fiber art. The technique for making this necklace is unique. It uses stitches you’ve seen before, like chain stitches, single crochet stitches, and slip stitches. It also uses some unusual ones, like the beginning chain twist and the reverse slip stitch, which are both easy to learn after reading through the pattern description. The stitch pattern is charted, so visual learners can rejoice! The beautiful green worked best with the color story for this issue, but imagine all the stunning colors you could choose for this project! Which color will you use for your first necklace? This wearable art pattern is an adaptation of the freestyle crochet forms used in Julie’s artwork. 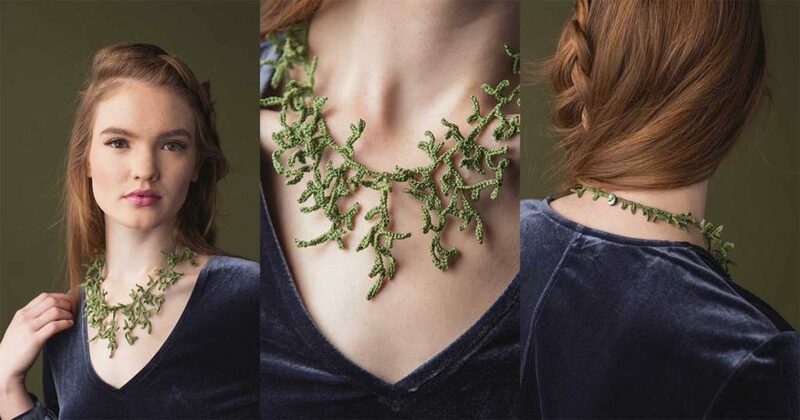 It is inspired by forms in nature and uses a unique tatting-like technique to create the tendrils falling from the necklace. FINISHED SIZE About 18″ long. YARN Lizbeth Size 10 Thread (distributed by Handy Hands) (100% Egyptian cotton 122 yd [112 m]/0.88 oz [25 g]): #684 leaf green med., 1 ball. HOOK Size 8 (1.5 mm) (affiliate link). Adjust hook size if necessary to obtain correct gauge. NOTIONS Yarn needle; 3/8″ shell button, 1 (sample used Buttons Etcetera LK12301/18 www.buttonsetc.com). GAUGE Exact gauge is not important for this project. Explore more fabulous crochet patterns in Interweave Crochet!